You may or may not have noticed, but I love Avery. And, perhaps not coincidentally, my history with this blog is kind of tied to Avery. One of my first interactions with the blog was when Andy and I shared a bottle of Avery Seventeen over some delicious grilled pork in tube form (RIP Sausage King). My first official review was Collaboration Not Litigation. And my first brewery report was at Avery's homebase. So of course, when I see something new from Avery, I tend to jump at it. 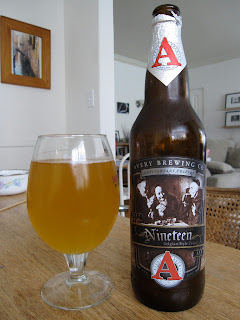 You might recall the Non-Snob review of Avery Eighteen- it may rate with Lion Imperoal as the worst review (in terms of content, not the opinion of the beer) ever posted here. Though at least in Lion's case, Andy had hit three or four bottles of Double Dog beforehand, so there was a reason for that shitshow. But anyway, even though it wasn't much of a review, this makes three years running for Avery's anniversary beers. This one is a tripel, which has become one of my favorite styles over the past couple of years. Looks pretty standard in the glass, though the head's pretty much nonexistent, atypical for a Belgian. The moment I poured it, I thought it smelled like a pilsner+Belgian- which of course seems like a bit of a contradiction (although there are Belgian lager yeasts floating around out there, e.g. Stella Artois). But it smells kind of lemony, and the funk has both pilsnery and Belgiany aspects. It also smells like there's a bit of brett in there, with a slight spoiled character. Yeah, there's gotta be brett in here- it's the first thing I taste. There's no official website I can find, and the bottle only mentions an "infamous Belgian yeast". But unless my palate's gone off the deep end there's definitely some brett in there. The tripel flavors are also present, but they don't feel quite as clean as some of the other tripels I've had. It's also a bit on the spicy side, almost like they've added a bit of saison influence. There's decent citrus and a nice light body, and it's pretty dry; you don't notice the alcohol in the slightest. But it's a bit heavily yeasty, and to me it upsets the balance a bit. In in end, I don't mind this, and I don't feel like I got hosed on the price. But it's not my favorite in the tripel category, and I probably wouldn't hurry to get it again were they to make this full-time.